Welcome to the Kelly Lab! Our research centers on how the "mother of all stem cells", the germline, is established during embryogenesis and maintained during development. We have discovered chromatin-based repressive mechanisms operating in the germline that prevent differentiation of germ cells into somatic lineages during embryogenesis, and maintain the integrity of the genome in adult germ cells. In the embryonic germline we are studying transcriptional and post-transcriptional processes that guard the germ cells during early development and regulate genomic activation. In the adult germline, we are studying how chromatin-based silencing mechanisms are targeted to large genomic regions, particularly the X chromosome. 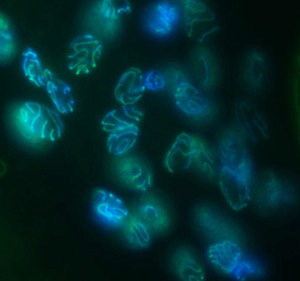 We have recently identified mechanisms that silence unpaired DNA during meiosis, and are investigating how such mechanisms contribute to genomic stability. In all multi-cellular organisms, there exist two basic cell types - somatic cells and germ cells. Somatic cells make up the structural components of an animal, such as skin, muscle, and nerves. The germ cells are the reproductive cells that will create the offspring of the animal. Embryonic germ cells and somatic cells both arise, originally, from a germ cell; i.e. from a fertilized egg. During development, the somatic cell lineages will enter a variety of differentiative pathways to generate the somatic structures of the adult. Each step along these paths will increasingly narrow the developmental potential of each cell type, preventing, for example, a hematopoietic stem cell from becoming anything other than a type of blood cell. Germ cells, in contrast, must refrain from undergoing any somatic differentiation so they can remain totipotent - they have to be the source of all cell types in the next generation. The germ cell lineage, or germline, has therefore been called "the Mother of all stem cells". During development, embryonic germ cells face an endurance test of character: they must ignore a bombardment of strongly coercive signals that easily influence their somatic cell neighbors, and remain refractive to these signals not only throughout development, but also across generations. What is the source of this "moral strength" that defines the character of germ cells? We are using the nematode Caenorhabditis elegans as a model genetic system to address this question. Results from our work and others have shown that germ cells are extraordinarily strict in terms of governing their transcriptional activity. For example, the entire genome is inactivated, or silenced, in embryonic germ cells. Later in development, germ cells become transcriptionally active, but do so in a very guarded fashion. We have carried out screens for mutants that are less "guarded" for germ cell gene expression and the results have been extremely interesting. The mutants are defective for fertility, indicating that these silencing processes are essential for germ cell function. In addition, some of the mutants are defective in germline suppression of transposon mobilization and meiotic chromosome segregation. This is evidence that processes that govern chromatin organization are involved in maintaining genome integrity. Our lab is currently working to identify the molecular nature of these processes to understand how chromatin organization contributes to germline totipotency, and how release from germline suppression contributes to somatic differentiation.